In honor of back-to-school time being just around the corner, Crispy Green is giving you and your readers a chance to win a prize pack filled with their entire Crispy Fruit and FruitziO lines! 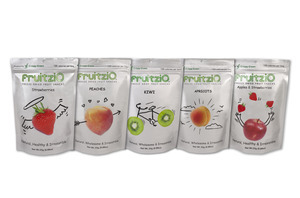 These all-natural freeze-dried fruit snacks are the perfect back-to-school treat. They’re portable, mess-free and low-calorie, which makes for an easy pick for your child’s lunchbox. What’s in it for you? The more friends and readers you can get to join the contest, the better chance YOU have to win. Each referral through Facebook or Twitter awards you an extra entry into the contest! Just go to the Crispy Green fan page on Facebook (facebook.com/crispygreen) and enter the "Like Healthy? Like Fruit? Like Crispy Green!" giveaway. Giveaway contest ends on July 27th, 2012.